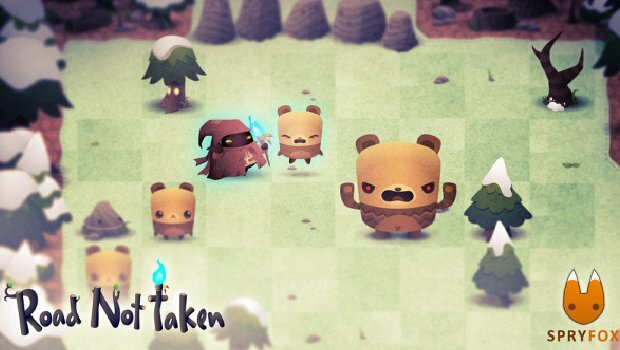 Triple Town creator Spryfox, which has possibly the most adorable team icon in all of indie games, has announced the development of “puzzle roguelike” Road Not Taken for the PS3, Vita and Steam. Details about the gameplay are a bit thin right now, and part of that is purposeful – the announcement notes that while players may die many, many times, the whole thing is meant to be a learning experience. Dying repeatedly, but learning from every death? That’s a roguelike attitude if ever I heard one – and Triple Town happened to be one of the most refreshing takes on the slide-and-match puzzle genre, definitely worth a look if you’re a fan of that sort of game and haven’t checked it out yet, or if the concept of ninja bears just happens to entice you. You can play for many dozens of hours, and no two sessions will ever be quite alike. Each game is full of unexpected surprises and dangers. We’re not going to spell out how to play the game. What does each creature do? Figure it out! You’re going to die many, many times. But you won’t mind that because each death teaches you something new about how the world works and how you might do better next time. The world unfolds and becomes more complex as well over time; you’ll progressively unlock new things to encounter and boosts that change the way you play the game. Sounds like my kind of game. You can tentatively look forward to this one in early 2014 for the PS3, Steam and Vita.